Earn up to 19,992 reward points. A large steel-string featuring the N2 neck and solid electronics. 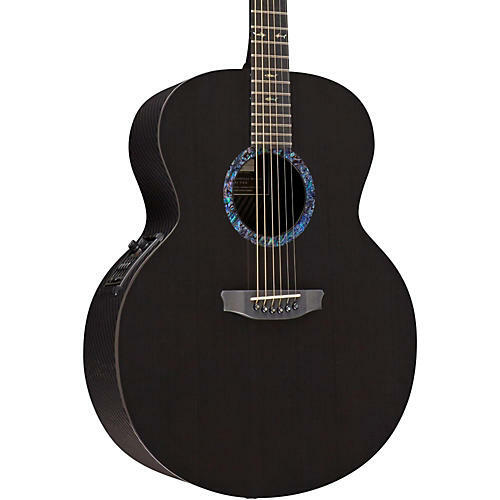 The Concert Series Jumbo Acoustic-Electric Guitar is all about warm tone. These are the lightest soundboards built by RainSong using unidirectional carbon. Unidirectional carbon mimics the tight grain of a fine spruce soundboard. Thus, it is not surprising that this line produces a warmer tone. How do you describe RainSong's JM? Three words: loud, loud, and loud. And if that's not enough, it's also loud. This is the largest body RainSong builds. The sheer size, combined with the attributes of Projection Tuned Layering make the JM one of the loudest acoustic guitars on the planet. This guitar is loud. We had to say it again. But the JM is not just about power. The narrow waist and some layering refinements specific to the Jumbo soundboard give the JM some real fingerstyle grace. The guitar is strong, but impeccably balanced, with bass, mids and trebles distinct, clear and, dare we say it again, loud. The N2 neck is a result of an extensive, long-term collaboration with the renowned artist Steve Miller (www.stevemillerband.com) and Master Luthier John Bolin (www.bolinguitars.com). The neck design is based on a modified "U" profile that has been popular in guitars since the 1950s. While the N2 has a more substantial feel than the N1 neck, it is ergonomically sound and actually results in better transfer of string vibration energy to the soundboard. The N2 features a truss rod that is accessible from the head stock. Graphite does not warp or bow with changes in humidity and temperature. The purpose of a truss rod in the N2 is to allow customization of the relief to suit individual preferences.